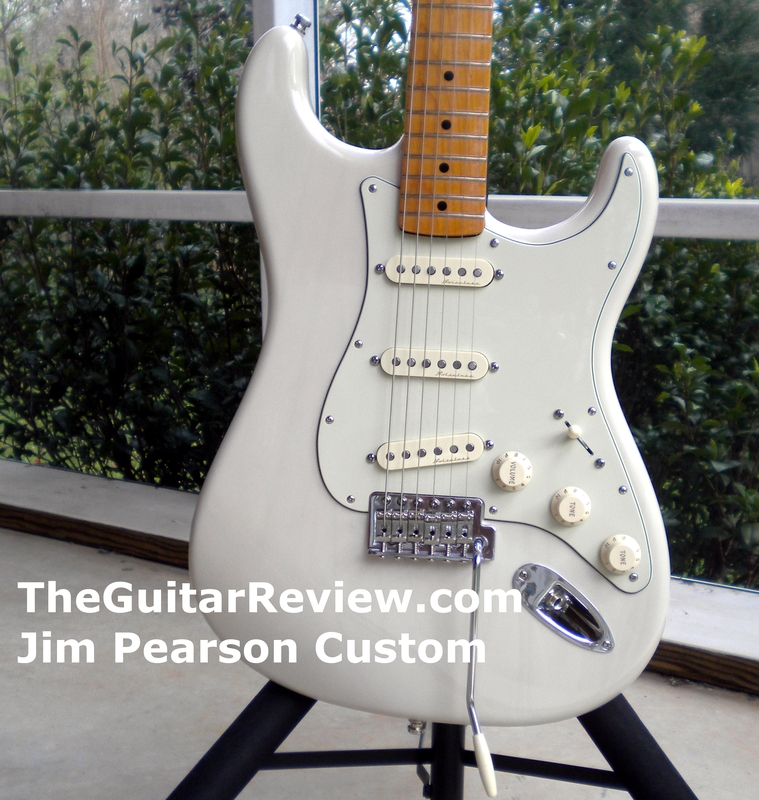 The Fender FSR Ash Noiseless Stratocaster Transparent White Blonde Review – Creamy Goodness! 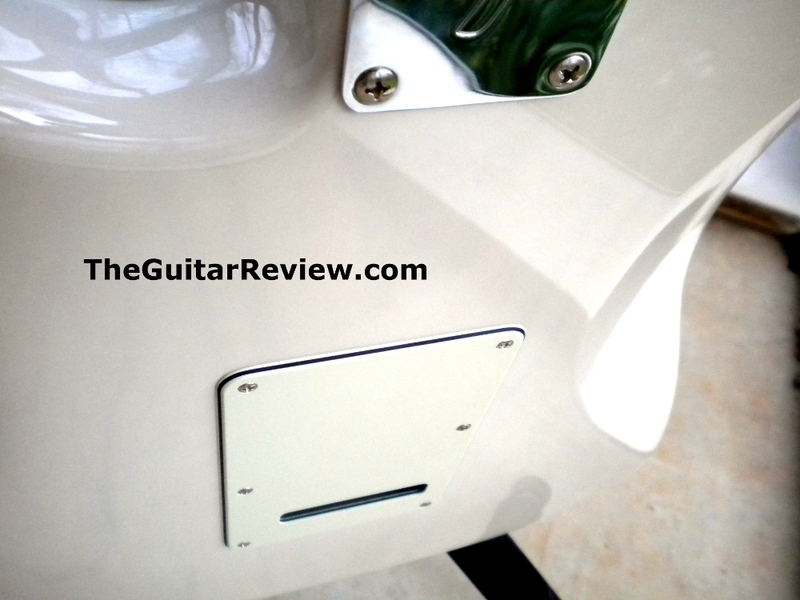 The Fender FSR Ash Stratocaster Noiseless See-through White Blonde Review! Good enough to own one twice! So, what is “FSR”, anyway? According to Fender’s web site, FSR means “Fender Special Run.” You can read a bit more here at Fender’s web site. The link opens a new window…. FSR Fender products pop up here and there, generally at major online or brick-and-mortar dealers. Sometimes the extra cool ones (like the ones that Jeff Allen signed) come to hometown dealers, too. I’ve had an FSR Strat or Tele here and there over the years. Sometimes they are just color combinations on the standard stuff, other times; they’re great combinations of great materials that aren’t offered together. Although zZounds doesn’t offer the blond ash Noiseless FSR Strat, they do carry a HUGE array of Fender Stratocasters. Click here and read all about them! It helps me write more reviews if you buy awesome gear at zZounds. Besides, they have great customer service and return policies! 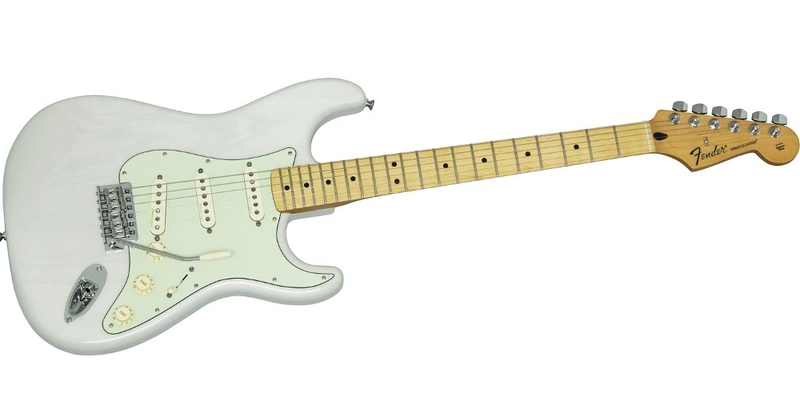 Quick Opinion: The FSR Ash Stratocaster with Noiseless pickups and the transparent white blonde finish is superb. The neck is (at least, at the moment) unique, the electronics are awesome, and the build quality is just fantastic. I love this guitar. If you’re looking for a mid-priced Stratocaster that won’t break the bank and will play its heart out, this is definitely one to consider! This particular FSR Stratocaster has good looks, easy playability, that wonderful ash-body sound, and the quiet power of Fender’s “Noiseless” single coil pickups. Even the pickguard is cool: mint green – like an old friend from the 70s that’s been around for a long time. The interesting neck, the mint pickguard, the pickups, and the look and feel of the transparent gloss finish on the ash body is intriguing and very playable. Sound: If you like a quiet Stratocaster that has the guts to pull off everything from country to blues to Stevie Ray Vaughan to Jeff Beck to Clapton, this guitar is a real contender. Overall, this Strat captures the essence of what a Strat sounds like, but with quieter oomph. 2) Tone woods – a one-piece maple neck and: Ash! Pickups and Electronics: The pickups are a big part of “the reason for the season” with these particular FSR Strats. The pickups are hotter than vintage, but aren’t super wide-open. They live up to their “quiet” reputation with their AlNiCo magnets, special enamel-coil wire, dressed magnet edges, and the nicely upgraded controls (pots, caps, resistors). They sound great, are nicely balanced, and are truly great at making that “Fender Strat” sound. The electronics are the upgraded/special set of controls that Fender sells with its Noiseless set kits. The tone pots and volume pot work superbly and sound just fine. All the solder joints are really clean and nicely done. The wiring is well-routed and planned – overall: nice stuff. I like the traditional CRL-style mechanical blade pickup selector switch. Fender, please don’t switch to those awful PCB switches (like those in the Blacktop Fenders)! Tone woods Some of the best sounding Fender guitars in history have been ash. Ash has a completely different character than alder or basswood. It has a denser tone (at least, to my ears), and has more definition and ring than alder. My particular FSR ash Strat sounds warmer and more full than my alder Stratocaster. It has a heavier feel to the shoulder, but I like the sustain and resonance of the ash. Body wood can be a really personal thing for Fender players, so I won’t take up a stance here – I just want to try to have an objective view of things in my reviews: Ash is a great tone wood, one that does great for rock styles and country styles. Playability This guitar fits the body like a soft cotton shirt, and the overall balance is excellent. The ash body is a little heavier than my alder-body Strat, but not enough that I really notice it. I found that the body feels smoother against my skin than my Highway 1, but not as buttery as my Jimmie Vaughan signature MIM Strat. The body is extremely high gloss, done to the nines. Someone spent A LOT of time getting this one right. When I sold my first one, I found myself pining away for it about a week later… I eventually saved up and bought another during a big online sale. The feel of the traditional Strat body is a story on it own, with countless thousands of friends out there to testify. It’s a very playable body, comfortable and straightforward. So very easy to reach the front of the guitar… you don’t spend much time thinking about the body’s contact with your arm and ribcage. Simple. Genius. Vintage-style (6-screw, non-floating) Fender Stratocaster bridges aren’t the most intonation-stable bridges. They require a good setup to stay close in tune for an extended period of play, but still go out here and there even then. If you want extreme tuning stability, you’ll need to go to a stop-tail with locking tuners, or a double locking trem such as a Floyd Rose, Jackson, Kahler, or Ibanez. (There are Floyd-bridged Strats out there…). If you can accept that you’ll have to tweak the tuning keys if you’re a big tremolo-bar-bomber, the vintage-style bridge is fine. When I’m not specifically looking for trem effects while I’m playing, I don’t even put the trem arm in my Strat’s bridge when I play it. To put this into perspective, when I recorded with my American Standard Stratocaster last month (two-point floating trem, Ping-style tuners), I had to stop and tune it several times when I pushed the trem around a bunch for some parts of the recording. I love the way Strats play. Even though I am a fan of many types of guitars, I’m not sure I’d ever do without at least one Strat in my closet. Playability: The neck This particular FSR Strat came with a neck that isn’t like its contemporary MIM Standard Strat cousins. The fretboard and headstock face are high gloss, while the back of the neck is a creamy semi-gloss/matte finish. The back of the neck feels a lot like my Fender Deluxe Ash Telecaster’s neck. The front of the neck reminds me a lot of the nicer Japanese Fender necks and the 50s reissue necks made in America and in Mexico. This (currently) unusual combination of gloss front/matte back is a neat combination. I felt instantly comfortable with it. The neck back profile is a general C “modern” shape and feels compatible with the necks of the Fender MIM Standard models. It’s just thick enough to feel substantial, without feeling like a Jackson speedy neck. The width is quite comfortable, and I find chording is just as easy as picking and arpeggiating. Nice neck. Quality: The build quality of my FSR Ash Noiseless blonde Stratocaster is nothing short of superb. There was only one flaw on the entire guitar: the neck pocket on the bass side has a tiny gap with the original neck, on the edge facing towards the headstock. I don’t think this is a deal-breaker for me. After all, this is not an Eric Clapton Signature Strat or an Eric Johnson Signature Strat. It’s a mid-line animal that was built with LOTS of attention to detail and love from the folks at the Ensenada plant. The back goodness of creamy transparent blonde. You can just see the grain in this (not my best) picture. The “F” neck plate is my addition: factory versions ship with a plain neck plate. I’m gushing, but then again, this guitar deserves it. I don’t know that every one is this way, but the two I’ve had were excellent examples. I would have a hard time choosing between this Strat and the much more expensive 50s Player Stratocaster. I like the 50s Player: a lot! But this one is much more affordable and sounds much better! The difference for me? The body wood wins on the FSR and the neck wins on the 50s Player. Wishes: I do wish these particular FSRs had V-shaped necks. Otherwise, I love them just like they are! This entry was posted in Electric Reviews, Guitar Review and tagged ash, electric, fender, guitar, maple, noiseless, review, single coil pickups, strat, stratocaster by Jim of Vivid Peace. Bookmark the permalink.